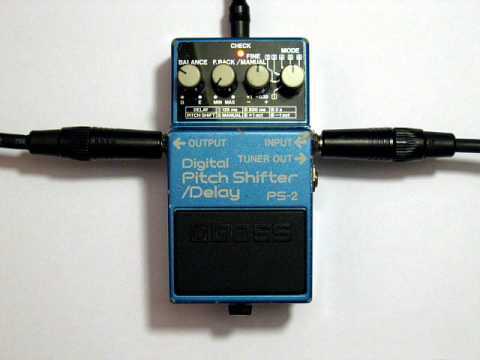 Question: Does the Boss PS-2 Pitch Shifter/Delay work with the Fender Champion 20? Can't seem to get any effect out of it through the amp. Hey all, newcomer (to guitar) here. I'm heavily interested in the shoegaze genre, so I picked up a delay pedal to begin learning around. I liked the classic sound of the PS-2 by Boss (late 80s model). I also got the Fender Champion 20, a seemingly good beginner amp. However, I can't seem to get any effect out of the pedal while playing. I know the pedal itself isn't 'dead' per say, as the light turns on and I can hear a small amount of feedback right when I plug it into the amp. No delay when I'm playing, though. All it seems to do is compress the sound when I turn it on. Is it possible that the Champion may not work with a pedal this old? No, it should be working fine. Make sure your guitar cable is plugged into the INPUT jack on the right side of the pedal, and the cable running from the OUTPUT jack on the left side of the pedal goes to the input jack on your amp. Set all four knobs at 12:00, play through it while stomping on the pedal's switch, and report back. If it's not delaying the signal, chances are the pedal is defective. Do you have the correct power supply? If not, try a 9 volt.